NETGEAR's EX6150 AC1200 WiFi Range Extender is the first of the three AC wireless extenders announced at CES 2015. As the name indicates, it's an AC1200 class extender supporting maximum link rates of 300 Mbps in the 2.4 GHz band and 867 Mbps in 5 GHz. 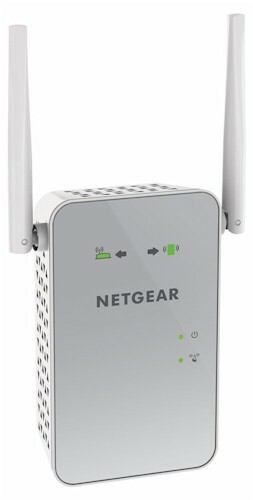 The two radios can extend both bands simultaneously or be configured in what NETGEAR calls "FastLane", which uses one radio as a "backhaul" to the router or AP being extended while the other is used to connect clients. This avoids the 50% retransmission throughput penalty imposed by the basic wireless extension process. "FastLane" has lately lost some of its appeal, however. Other new extenders, like Linksys' RE6700 I just reviewed, can avoid the retransmission penalty for clients connecting on both bands, making the backhaul decision on a packet-by-packet basis. On the NETGEAR, you select which radio to use for backhaul and the setting is static, changing your simultaneous dual-band extender into a single-band device. The callout diagram below shows the EX6150 can be used as a mini dual-band access point by flipping a switch. There is also a power switch, another welcome feature. The single Ethernet port is Gigabit and supports LAN connection in AP mode and client connection when used as an extender. The EX6150's antennas aren't upgradeable and there is no USB port to support ReadySHARE USB storage and printer sharing. Unlike the Linksys RE series extenders, the EX6150 doesn't have an audio output jack to support DLNA streaming. It does, however, retain the four LED placement indicators introduced on the EX6100. Check that review for more on how the indicator system works. NETGEAR didn't block the internal FCC doc photos, but the FCC photos weren't clear enough to allow identifying all key components. So I opened up the EX6150 after testing was completed. The design consists of power and signal boards connected by a four-pin connector, tucked neatly into the case. Like in the EX6100, the two-board assembly is completely removable, because the power board connects to the AC plug prongs via spring-loaded contacts. The components summarized in Table 1 show a MediaTek design centered around MediaTek's MT7621ST router SoC that provides the CPU and gigabit Ethernet port. The other NETGEAR extenders we've so far reviewed are also listed for comparison. This is the first time I've seen a Mediatek based extender with a separate processor SoC. Note both radios have external power amplifiers. 64 MB Winbond W9751G6KB-25 64 MB Winbond W9751G6KB DDR2 ?